My radio career has begun!!! I was getting ready to host a radio program. After having done the mid-season review, I figured I should have some follow-up. Walk with me through my television viewing one more time.. This must have been an interesting season of television in order for things to have gone so very, very strange. Usually, I don't get commercials for the new fall shows kicking around until August. That includes the mid-season replacements. And while I liked more than a few shows this season -- and I'll review those a little later -- some of these look like fun. And between Arrow, Flash, Gotham, and Constantine, DC looks like it's going to go toe-to-toe with Marvel on television. You want to place money on who's going to win? Oh, all right. Then there's the extended version. This makes up for the poor, Smallville marketing Fox has subjected us to, lately. It seems that Fox has decided to follow up on limited run series, after the 13-episode run of Sleepy Hollow. I'm only in it for David Tenant. I could never get into the series. And while I like Statham well enough, I was never his biggest fan. The tv show looks like fun though. This is a "Winter" release.... Yes, I liked the original tv films. Yes, I'm such a nerd. Author Jim Butcher, creator of The Dresden Files, is a fan of making his characters suffer. His hero, Harry Dresden, is usually being beaten up, or having his home / office / car destroyed, and we won't even touch his love life. In fact, when a panel he was on at DragonCon was asked about making characters suffer, he leapt for the microphone, he was so eager to answer that. When The Dresden Files was turned into a half-assed tv show starring Paul Blackthorne, it was a train wreck -- casting issues, scripting issues, money issues, and the issue that it looked nothing like the novels. When something similar happened with author Clive Cussler's book Raise the Titanic! when it had been turned into a film, he later went to see Raiders of the Lost Ark, and wept, because that's what his movie should have been like. I was a little lazy last week, in that I didn't post....anything, really. Okay, I kinda did, just not here. I was recruited for a news site that wanted people who had no problem taking news columns and commenting on them. The commentary includes sarcasm set to kill, and common sense. It's also the part where I reveal either my inner nerd, or my inner radical. I've discussed my politics on this site before. I'm either right-wing or left-wing depending on who you ask, and where the jury is sitting. A Pius Man was such that I've had good reviews on both sides, so the book came off as being fairly neutral. It may help that I'm sort of libertarian....in that I really don't give a crap as to what you do, believe, think or say, as long as you're not screwing around with anyone else. I really don't. I'm too freaking tired to play politics. Granted, my general attitude is that the gene pool needs a good healthy dose of chlorine. Heck I've got a friend who agrees with my every belief in politics, and I still want to deck him every time he opens his mouth about it. But, yeah, if you really to see my general frustration with politics, politicians, and the stupidity of the universe, go check out The American Journal. 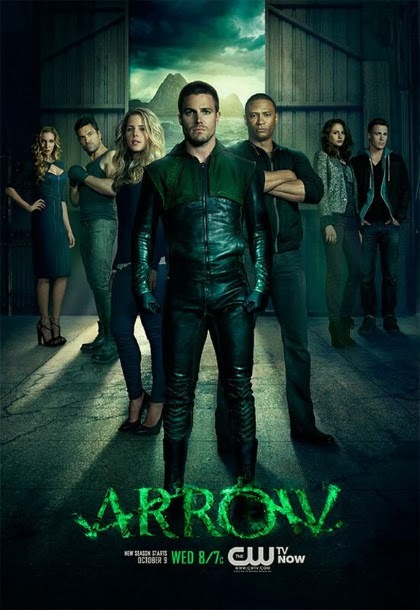 Today I should have a whole list article on Arrow vs. Agents of SHIELD. Also, last week included an interview with Daria Anne DiGiovanni, which you can tune into below. You might remember her from previous interviews. Just to clear up any confusion, the atheist I refer to in the interview is not Matt, the artist who has contributed to the blog. I come across a lot of people. Train wrecks happen a lot in my life.